NTI offers job placement / career development assistance to graduates who successfully complete the course and are in good standing with the school. Meet our Job Placement team. NTI is committed to continuing innovation through today’s technology. This is why NTI has created the My Maine Job for its students and alumni. To speak to a friendly and knowledgeable NTI Career Advisor, call us at 1-800-447-1151. Ask about coming in for a free tour. 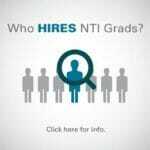 See for yourself what career training from NTI is all about, and how this could be the change you’ve been looking for.